For people in parts of Hunter, Metropolitan, Central Tablelands, North West Slopes and Plains and Northern Tablelands Forecast Districts. Issued at 10:43 pm Friday, 7 September 2018. 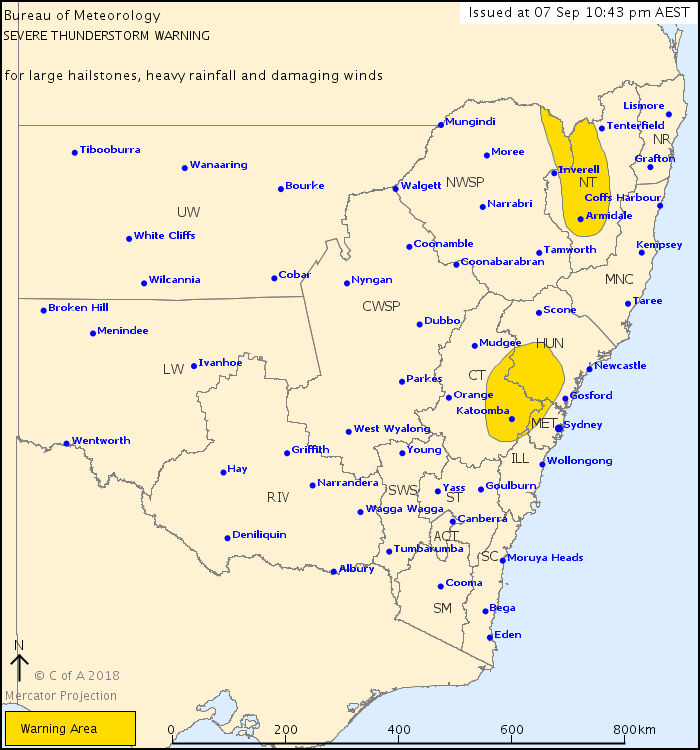 Severe thunderstorms are likely to produce large hailstones and heavy rainfall that may lead to flash flooding over the next several hours in parts of the Hunter, Metropolitan and Central Tablelands districts. Locations which may be affected include Penrith, Katoomba, Springwood, Capertee, Bilpin and Oberon. Severe thunderstorms are likely to produce heavy rainfall and damaging winds over the next several hours in parts of the North West Slopes and Plains and Northern Tablelands districts. Locations which may be affected include Armidale, Glen Innes, Guyra, Uralla, Emmaville and Ashford. Severe thunderstorms are no longer occurring in the Northern Rivers and Mid North Coast districts and the warning for these districts is CANCELLED. 58mm of rain was recorded in 60 minutes to 6:21pm at Bankstown. 45mm of rain was recorded in 60 minutes to 6:18pm at Milperra. Pea-sized hail reported at Zetland 6:10pm and Maroubra at 6:20pm.